You are here: Home / Dog Names / Schnauzer Names – Which One Will Suit Him Best? Schnauzer Names – Which One Will Suit Him Best? Are you looking for the very best Schnauzer names? Choosing the right name for your adorable Schnauzer puppy is important. So, whether you’re looking for girl schnauzer names, giant schnauzer names, cute schnauzer names, or German schnauzer names, you’ll find lots of inspiration here! But first, let’s look at why choosing the right schnauzer puppy name is so important. Why is choosing the right name for your Schnauzer so important? The Schnauzer breed has a bubbly personality and is full of fun, but every dog has a different character. That’s why it’s important that your puppy’s name suits him or her. There will always be an element of guesswork involved in naming any puppy, as you won’t know what sort of “person” he will grow into. 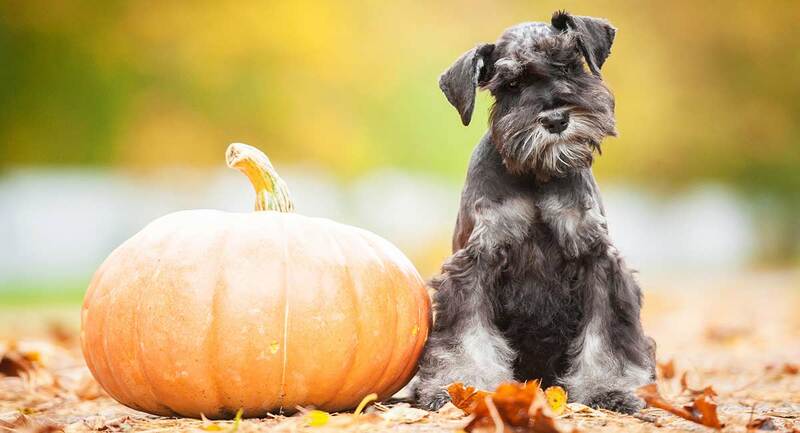 However, you will know what color your pup will be and what size he will grow to be, depending on whether you have a Miniature Schnauzer or a Giant Schnauzer. As well as reflecting your dog’s looks and personality, your dog’s name also needs to fulfill a purpose. Always choose a short name that’s easy for your pup to learn and remember. Don’t choose long, complex names, unless you can think of a cool nickname that your Schnauzer will be able to learn easily. So, let’s dive right in and look at some cool dog names that might suit your Schnauzer! You can draw inspiration for Schnauzer names from many sources, some of which can be quite unexpected. For example, you might have a family member, friend, or colleague who bears more than a passing resemblance to your pup! Be careful though if you do choose someone’s name for your pup, in case you cause offense. It might be a good idea to ask them before you name your Schnauzer after them! A really good source of inspiration for dog names can be found in lists of baby names. These books typically publish the meaning of each name too, so you can choose a name with a special relevance to you. If you find two names that you like and you can’t decide between them, why not combine both? You could create a unique Schnauzer name for your pet and be one hundred percent sure you won’t find another pup with the same name! Female Schnauzers can be every bit as cheeky and cute as their male counterparts. We think these female dog names would look great on a lady Schnauzer! You can find more names for female dogs at this link. There are plenty of male dog names that look good on a Schnauzer. For more male dog names, check out our suggestions here. If you have a male Schnauzer puppy, you might like to choose a German name for him that reflects his heritage. Schnauzer names for male dogs often sound very strong and macho and suit Giant Schnauzer boys perfectly! Cartoons are something everyone remembers from their childhood and the names of your favorite cartoon characters can make good names for Schnauzers. There are plenty of historical figures that had great names that would suit a Miniature Schnauzer. If you like the idea of choosing a mini Schnauzer name from history, you might like these female miniature schnauzer names. Remember to abbreviate a long name so that your miniature schnauzer girl names are memorable for your pup. And it’s not just the girls who get to enjoy names taken from famous historical figures. Here’s a selection of historical names, just for the boys! These Schnauzer names are inspired by some of our favorite adult beverages. Always name your pet responsibly! If you think that your Schnauzer has movie star looks (or Hollywood teeth), you could name him or her after a famous movie character. Perhaps you have a favorite film? If you do, why not choose your Schnauzer’s name in honor of your favorite character? Here are a few popular movie star names that we reckon would suit a Schnauzer. All Schnauzer dogs are cute, even the giant version of the breed. And cute dogs deserve cute names, right? Our selection of cute dog names is sweet, sparkly, and guaranteed to tug on your heartstrings, just like your new Schnauzer puppy! If you need more ideas, check out this list of cute dog names for inspiration! Pick a name that has two syllables at the very most. Of course, you can choose a longer name if you find one that you absolutely love, but keep in mind that a very long name may make it tricky for your puppy to learn. If you have your heart set on a long name, abbreviate it to a nickname that your pup finds easy to remember and respond to. If you have other dogs and cats, don’t give your new Schnauzer puppy a name that sounds very similar to that of one of his housemates. Be careful not to choose a name that could be confused with a training command. For example, “Schmidt” is a brilliant German name for a male Schnauzer, but it can also sound very much like “Sit!” Imagine how confused your poor dog will get if he mishears you across a busy dog park and sits there obediently when you actually want him to come to you! Choosing a great name for your new Schnauzer puppy is very important. The name must be one that you will always love! Don’t choose something that seems funny or cool at the time but could very quickly start to sound silly or stale. Do choose a name that is easy for your puppy to learn and remember. Make the name unusual so that your dog doesn’t become confused when you call him to come to you. We hope you find inspiration and lots of ideas for Schnauzer names in our suggestions! If you do choose one of our ideas, please tell us in the comments section below. And if you already have a Schnauzer dog, we’d love to know what his or her name is and how you came to choose it!